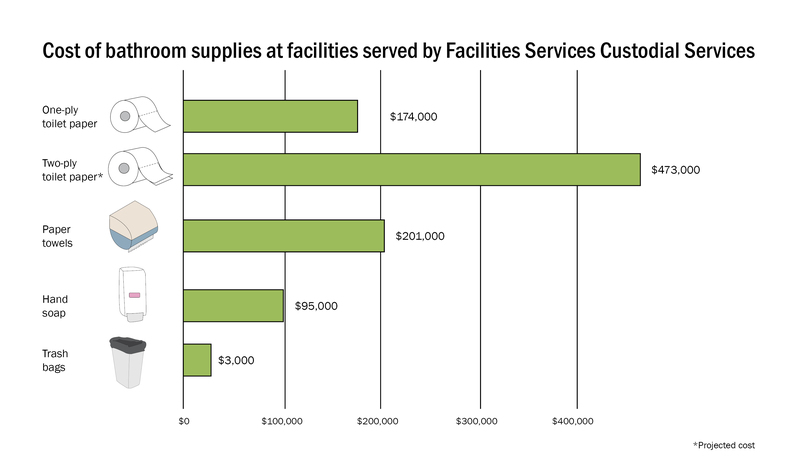 Toilet paper costs the University $174,000 a year, when just looking at buildings served by the Facilities Services Custodial Services. Facilities Services attends to 92 academic and administrative buildings on campus. They do not handle buildings served by the Division of Housing and Food Services, Student Unions and Intercollegiate Athletics. Annually, paper towels cost $201,000, hand soap costs $95,000 and garbage bags cost $3,000. The total cost for supplying bathrooms on campus with all these necessities totals to $473,000 a year. Last year, Student Government voted on legislation in support of changing the University’s one-ply toilet paper to two-ply. While it did not pass, Facilities Services still evaluated the potential cost increase to make the switch and decided against it. Student opinion is always wanted and valued, but going to two-ply would not be possible at this time, said Sally Moore, associate director of Custodial Services. With 39,523 enrolled undergraduate students on campus in 2015, an increase of $299,000 a year in toilet paper would cost each undergraduate student $7.57 a year. Add the 11,790 graduate students, and the cost decreases to $5.83 per student. Liam Woolley-Macmath, supply chain management senior and one of the authors of the resolution, said in an editorial from February 2014 that student complaints drove him to write the resolution. Although the total cost of changing from one-ply to two-ply toilet paper seems inexpensive when evenly distributed among the student population, UT still cannot make the change, Moore said.